Fall means football season, and football season means standing around in a parking lot, munching on chips and dip with old (and new!) friends. Cahn runs Tailgating.com, a website dedicated to tailgating tips, recipes, photos and more. Twenty years ago he sold his house, bought a motorhome and hit the road to tailgate across the country. All of “The Commissioner’s” tips for tailgating smarter and cheaper revolve around one easy-to-remember concept: Keep it simple. Cahn says he used to buy expensive jerseys for all the teams he supported. But, especially in the NFL, those jerseys quickly became outdated when players got picked up by other teams. Now, he hits up thrift shops to show his team spirit. Instead of jerseys, he buys plain shirts in his teams’ colors. While you’re at the thrift shop, look for a twin-size fitted sheet — Cahn uses one in his teams’ colors as a table cloth that won’t blow away. Genius! Calling all college football fans: Did you know you can get cheap team gear by scouring deals in your university’s surplus property department? All public colleges and universities, and some private schools, are required to dispose of stuff they don’t need anymore by selling it through a surplus property department. Some schools sell their stuff online, others have stores and others do property auctions. Like all campus departments, the athletic departments at most schools end up with extra gear now and then. The University of Wisconsin, home of the Badgers, had a huge sale in August and sold football jerseys for just $20! The key to keeping tailgating costs reasonable is to invite your friends, then get them to chip in. Download a handy money transferring app so that your friends have no excuse for not paying you back. It’s pretty hard to get around the cost of parking at most stadiums, but if you park just one vehicle at the stadium for tailgating and everyone helps pay for parking, you’re going to be much better off. Pro tip: Park one car at the stadium and have everyone else in your group park farther away, where it’s free. Then carpool, walk, or take the bus or a game-day shuttle. Or, if you want to eliminate parking costs entirely, consider tailgating in someone’s driveway or backyard before heading over (responsibly!) to the game. Cahn says his favorite money-saving potluck technique is to split up food, drinks and other items into categories. Make a list at the beginning of the season and rotate who brings what each week, so that no one is stuck bringing the most expensive items — alcohol and meat — to every game..
Stay within your budget by remembering that, ultimately, tailgating is not about the food. It’s about the people, the atmosphere and the experience, Cahn said. In his travels to all 31 current NFL stadiums and more than 126 college stadiums, Cahn has eaten everything from steak and lobster to a can of beans and hot dogs. “Anything goes at a tailgate,” he said. That said, there are some ways to save money when it comes to tailgate munchies. This list of tailgating recipes that will cost you less than $1 per serving includes tasty black bean dip for chips and veggies, and caramel popcorn with peanuts. Consider becoming a mystery shopper and you can get some of your tailgating food for free! Don’t forget coupons and rebate apps, which can help you get your ingredients for less. Or, buy your tailgating supplies with a credit card that offers you cash back on groceries and other purchases. When it comes to tailgating, your slow cooker is your best friend. Use it to make chicken wings or, to save money by not buying as much meat, to make vegetarian spinach dip. If you’ve got an 11 a.m. kickoff, head to the grocery store that morning and check out the day-old bread and pastry section. Most stores drop the prices of breakfast favorites like donuts and muffins — your friends won’t be able to taste the difference. Skip Starbucks and brew your own coffee at home, then bring it with you in a thermos. Keep in mind that your food portions don’t need to be huge, either. There’s a time and a place for expensive wine, fancy champagne or complex mixed drinks with a half-dozen ingredients. But remember what Cahn said: Simpler is better, even when it comes to booze. It’s OK to buy cheap beer, or to exclusively buy beer that’s on sale at your local liquor store (mine frequently sells craft beer for $2 to $5 off). Of course, the simplest way to save money on booze at your tailgate is to… drink less. 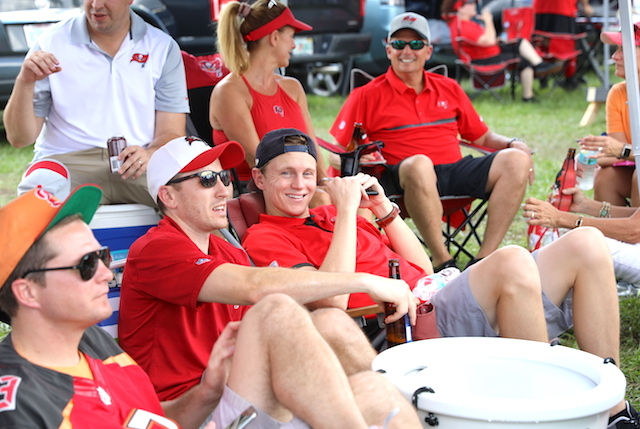 Cahn had some other useful tips for making your tailgate awesome this season. For starters, make sure you’re not parking in a regular tailgater’s spot. Cahn likes to think of tailgating like a neighborhood block party: Be a good neighbor, at all times. “If this is the first time where you’ve been out to a new stadium, what you want to do is ask, ‘Is this somebody’s spot?’ so you’re not intruding on someone’s traditional spot,” he said. Bring name tags, which will help new and old friends get to know each other. Bring a heavy-duty trash bag or double-bag your garbage, because no one wants to get halfway to the dumpster when suddenly beer, potato salad and other trash spills out. Hand sanitizer is also a good idea, Cahn added. If you’re grilling, make sure you dispose of charcoal safely. Definitely don’t leave hot coals on the asphalt, because someone might park there later. And it’s always a good idea to bring a first-aid kit and a fire extinguisher. Your Turn: What are your favorite ways to stay on-budget while tailgating?